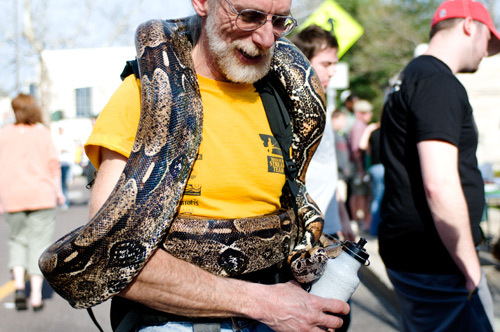 "Columbia resident Peter Yronwode wanders through the crowd in Peace Park on Sunday to show people his boa constrictor, Isis, while educating curious observers." Photo taken April 22, 2008 by William Lounsbury/Senior Staff Photographer, The Maneater. "From the Hills to the Grills"
"Lab on a Ladder: Stack Emissions Tests Reach New Heights"